Hokosha-Tengoku (Temporary auto-free zone) started in Ginza in 1970. 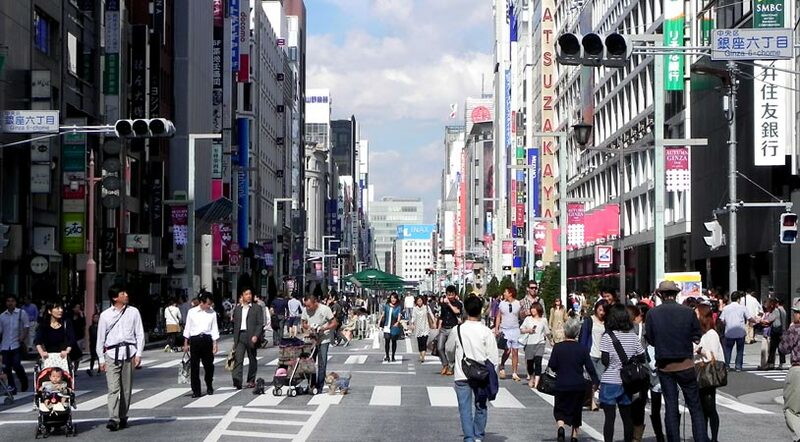 On every weekend pedestrians can enjoy strolling around the fashionable streets of Ginza. However, I always wonder why not include weekdays and create complete auto-free pedestrian zone in Ginza. 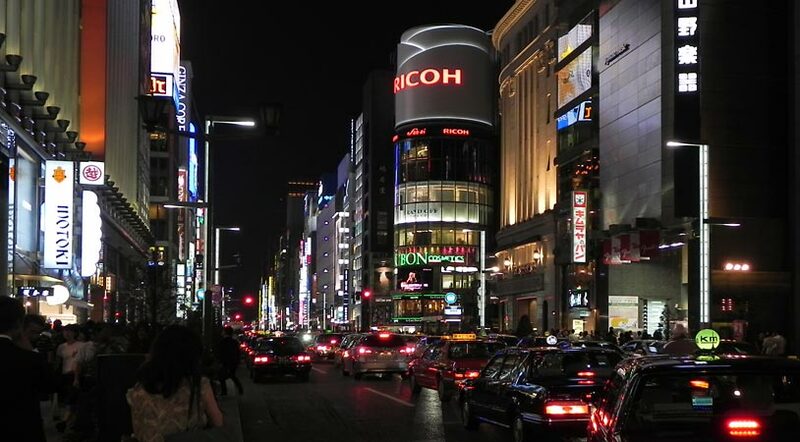 Ginza is the most famous shopping district in Japan and known as such also in the oversea countries. Compared with other popular shopping districts in Tokyo such as Shinjuku, Shibuya and Ikebukuro, Ginza has a distinctive atmosphere. People surely feel there more tradition and high-brownness. This impression is the product of concentration of long-established and exclusive shops and flag shops of internationally known fashion brands. However, I believe that the more fundamental factor is the survival of original planning. 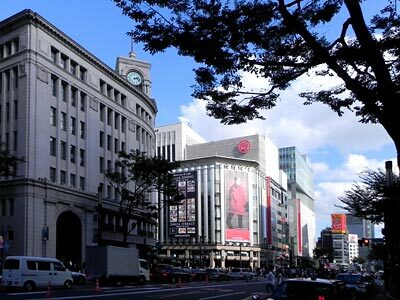 Even though most buildings of Ginza are fairly new - all existing buildings including the oldest ones were built after the Great Kanto Earthquake in 1923 - the city plan of Ginza well preserves its regular grid pattern originated at the beginning of Ginza 400 years ago. Ginza was destroyed many times by natural and human-made hazards, but the reconstructed city always kept the basic plan of the original Ginza and this influenced the development of Ginza and its sub-areas. When Tokugawa Ieyasu (1543-1616) started to build Edo as the seat of his government in 1590, Ginza was an uninhabited peninsula in front of the would-be castle. In the first phase of the construction of Edo, Ginza Peninsula was used to store building materials of the castle. Building of Ginza started in the second phase of the construction in 1612. In this year silver-coin mint was transferred to the present Ginza-2-chome(1) and became the origin of the later place name. 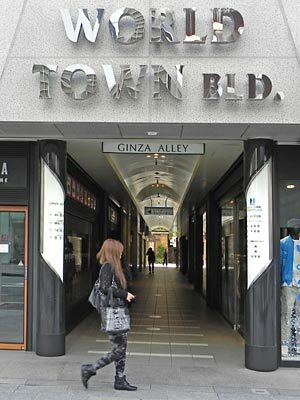 The word "Ginza" was used for place name first in May 1869, but Ginza at the time included only Ginza 1-chome to 4-chome and narrow areas on the both sides of the Ginza Street. 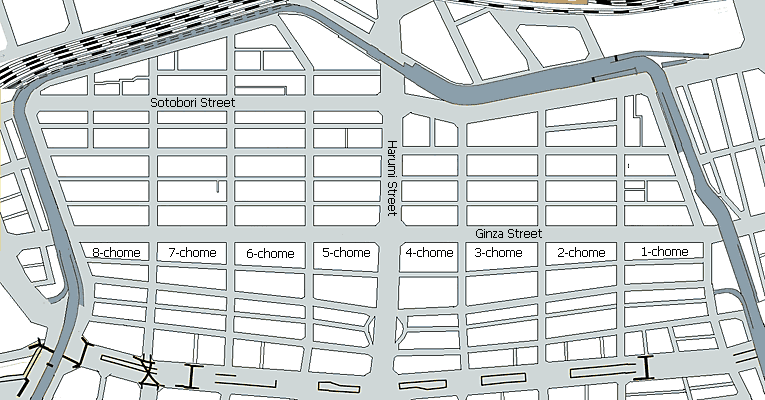 Ginza was expanded to 8-chome in 1930. Until 1951 when Sanjusangen-bori moat was reclaimed in order to dump the debris of the American air raids, Ginza was completely surrounded by moats. However, starting with Sanjusangen-bori all moats were reclaimed by the time of the Tokyo Olympic Games in 1964. Then, automobile roads were constructed as a symbol of Japanese modernization (check the former Sotobori moat(2)), though many of us regret the loss of moats and the related cityscape afterwards. When Ginza district was constructed in the 17th century, it was divided into square blocks each of which was about 120m x 120m. It is interesting enough to know that there were originally no side alleys going through a block. Side alleys were first constructed after the big fire in 1657 and the network of side alleys gradually expanded till the construction of a completely Western style brick building main street in the 1870s. Ginza was surrounded by moats till WWII. Check the location of the moats and bridges. I explored Ginza from its side streets, because the old Ginza is still very much alive there. 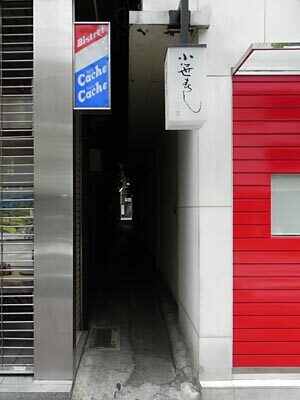 I find for example an elegant side alley Mihara-koji, though it was modernized in recent years. It connects Azuma-dori and Mihara-dori which extended parallel to the Sanjusangen-bori moat till it disappeared in 1951. Mihara-koji was a product of cooperation of small land owners facing the alley. 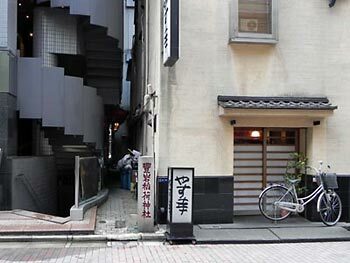 When WWII ended, they boughtsmall strips of land from a large land owner and pawnbroker Tobei Tamura and made this side alley from a part of their land. Azuma Inari(3) was invited in the post war time when fires occurred frequently. Mihara-Koji; on the left side you can see Azuma-Inari. 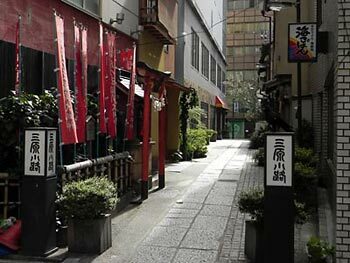 A nearby alley connecting Azuma-dori and the main street of Ginza was made as a fruit of cooperation of 11 small landowners to preserve an alley(4), when Ginza Core was built in 1971. 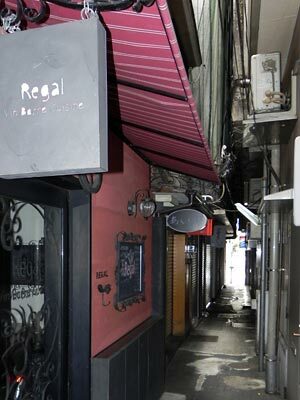 The owners' shops exist on the both sides of the alley. 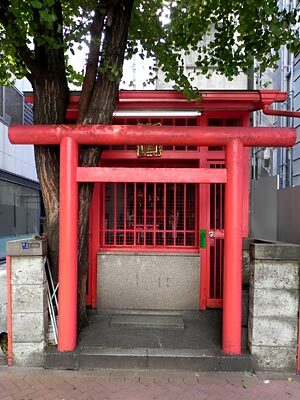 I could find three other small shrines in narrow alleys, while many old shrines were moved up to the roofs when new buildings were built. They still exist there thanks to the tedious efforts of the neighbors to keep them. Hodo-Inari(5) exists just behind the busiest Ginza 4-chome crossroads(6). It enshrines the god helping parents to have babies. Saiwai-inari(7) is located in Gina 1-chome. The neighboring buildings were all torn down, in order to build a new building. 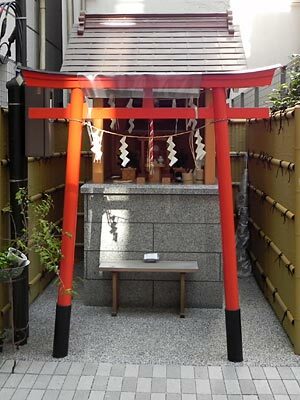 However, before the small shrine was finally bought up by the real estate agent, it went bankruptcy and the construction stopped for the time being. A roumor says that the company incurred punishment of the Inari. 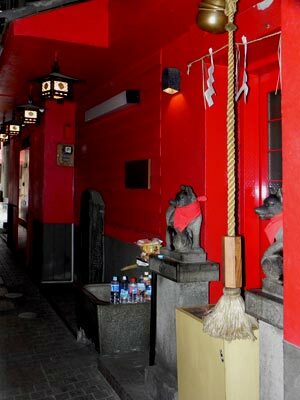 Saiwai means happiness and the Inari was worshiped for centuries as a divine to bring happiness to prayers. A surprising example of survival is Toyoiwa-Inari(9). Now it exists in an extremely narrow side alley. However, it has many worshippers in particular in the entertainment and show business and the small shrine was finely restored only a few years ago. 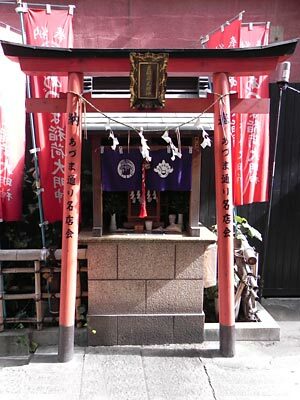 Hachikan-jinja (13) was originally the community Inari shrine of Hachikan-cho. 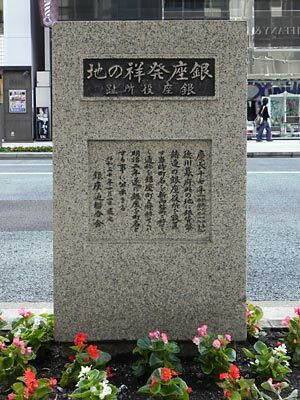 When the community name was abolished after the Great Kanto Earthqake in 1923, inhabitants wanted to retain its community name at least in the name of the shrine. It is said that once "Yayous Hachikwan" lived here. While "Yayous" might be the Japanese name of "Jan Joosten", no plausible explanation is available for "Hachikwan". Entrance of the narrow side alley leading to Toyoiwa Inari. By the way "za" of Ginza means an organization of people in a certain business sector. Silver mint was one of them. Not only craftsmen but also artists were organized in "za" and allotted certain area of the district. 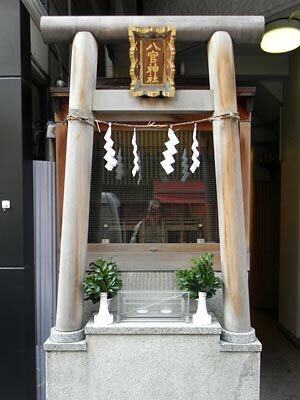 "Konparu" - a Noh-school - still remain as alley name and the name of the only remaining public bath(10) in Ginza. Some side alleys are still used for daily life. 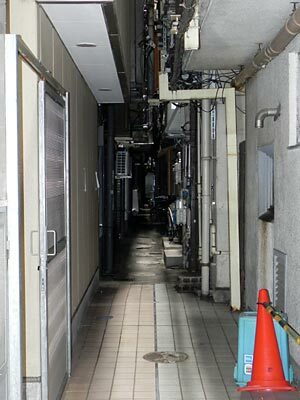 Some of the alleys which were built till the beginning of the Meiji period still exist, but in extreme conditions between buildings. Though they are gradually sacrified for new buildings, the remaining alleys still serve the daily needs of the neighbors, so far as the small buildings are not bought up by agents and absorbed in the new buildings. 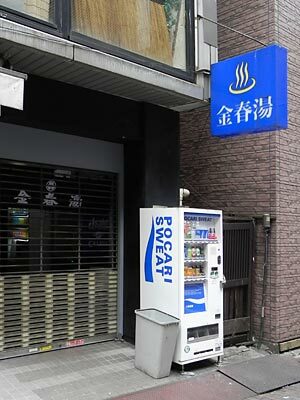 The trace of the old Sanju-sangen-bori can be seen near Ginza 4-chome crossroads. Where Harumi-dori crosses the Sanju-sangen-bori there was a bridge called "Mihara-bashi". Mihara-bashi does not exist anymore as a bridge. 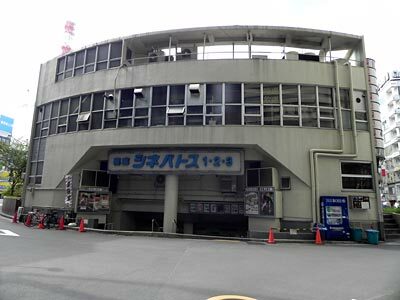 But its name remains as a place name and its bridge girder is still used by an underground shopping passage underneath the Harumi-dori accommodatinhg a cinema center and a number of bars. The underground passage(11) was built in 1952 and the second oldest underground passage in Japan. The last example I want to take up here is Okuno Building(12). 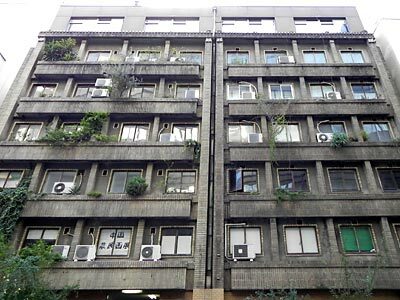 It was built in 1932 and offered luxury one-room Western style apartment rooms to the people in Tokyo who at the time still had a very Japanese life style. In the first years after the opening artists such as Saijo Yaso (poet) and Sato Chiyoko (singer) were among inhabitants. They could easily see Sanju-sangen-bori which existed just below their windows. It might be also possible for them to see Sumida River, Tokyo bay and Boso Peninsula, a dynamic panorama which we can now only enjoy if we live super high buildings.